Fashion films and documentaries are like rare jewels. Sparkly and beautiful they appear infrequently and when they do I look forward to seeing them with unabashed excitement. And some I have watched many times, such as Bill Cunningham New York or Diana Vreeland: The Eye Has to Travel. I relish the behind-the-scenes glamour and the inspiration I get from these fabulous colorful and creative people. At this bountiful moment there are three fashion films showing and I recommend seeing all of them for various reasons. 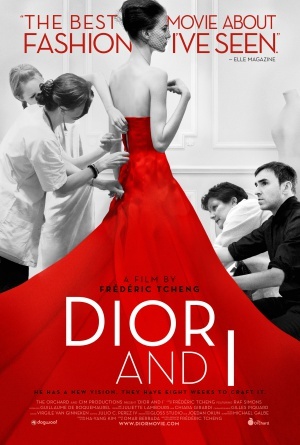 This movie documents the arrival of Raf Simons as the new artistic director of the Christian Dior fashion house and follows him as he creates his first Dior haute couture collection in the Spring of 2012. Simons has only eight weeks until the day his designs walk down the runway. And he has to prove himself. Since he is known for his minimal design, many wonder if Simons is the correct choice for Dior. The vulnerability of Simons is sensitively shown by film director, Frédéric Tcheng. Tcheng also wrote and directed the excellent Diana Vreeland: The Eye Has to Travel and edited Valentino: The Last Emperor. It's curious, who is the "I" of "Dior and I"? It is the man himself, Christian Dior, and it is Simons. During the film, a voiceover reads from Dior's 1957 biography, "Christian Dior and I". Dior sees himself as two people, the private person and the famous designer. Simons begins reading the biography as he starts to design his first collection, but the similarities between his experiences and Dior's are so close, he has to put the book down and focus on the collection. With a critical and worried eye, Simons studies his designs as they come to life. And the talented people I admire so much, the "petite mains" in the workroom. They are the women and men who bring the sketches to life with great mastery. 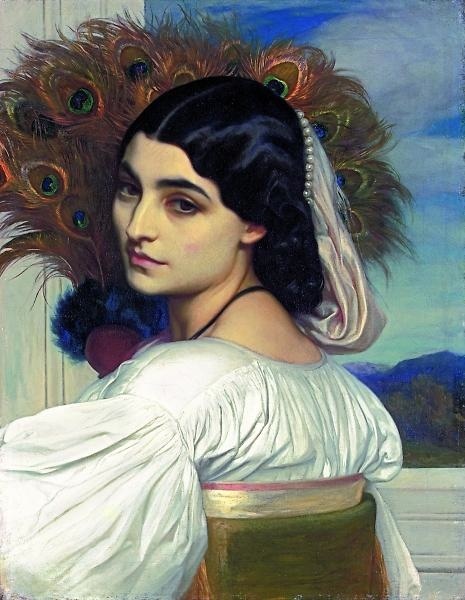 When getting dressed in the morning I make an effort at a bit of self-expression. I’ll add an oversized silk flower to my lapel, wear a mix of prints or a piece of heirloom jewelry. But all that seems feeble and pale now that I’ve seen the powerhouse of original style, Iris Apel, in this documentary. There are few people with her joy for self-expression, intense esthetic pleasure of dressing and sheer life force energy. All this is fed by her hunting and gathering clothing and accessories from all over the world. 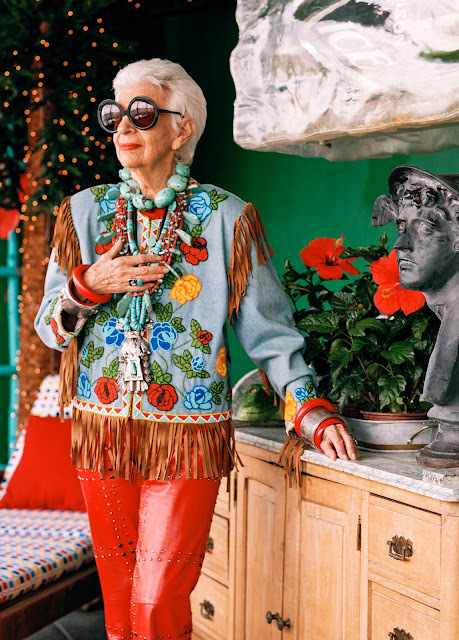 She shops everywhere on the fashion spectrum from the heights of couture to a discount shop on a side street in New York. 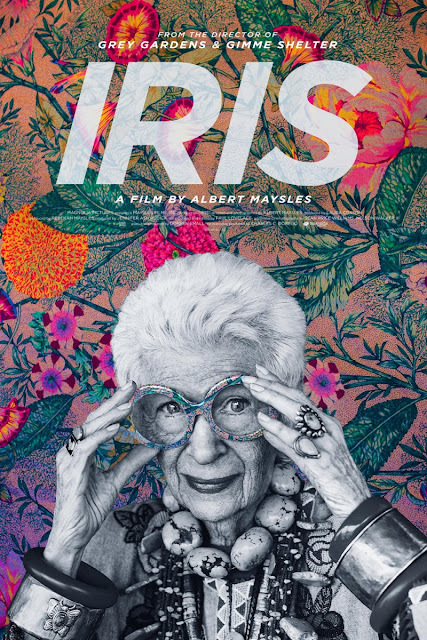 If you go to the official site for the film, click on the trailer to get an idea of the fabulousness of Iris and this documentary. Iris has her 94th birthday this August 29th. And I just had a great idea. Wouldn't it be fun to celebrate Iris and the expression of one's personal style by having a dress like Iris day on her birthday? Let's do it! "It’s better to be happy than well-dressed." "I like to do things as if I am playing jazz." "Life is gray and dull; you might as well have a little fun when you dress." "I’m not pretty and I’ll never be pretty, but it doesn’t matter. I have something much better. I have style." "When you don’t dress like everyone else, you don’t have to think like everyone else." And now for something totally different. 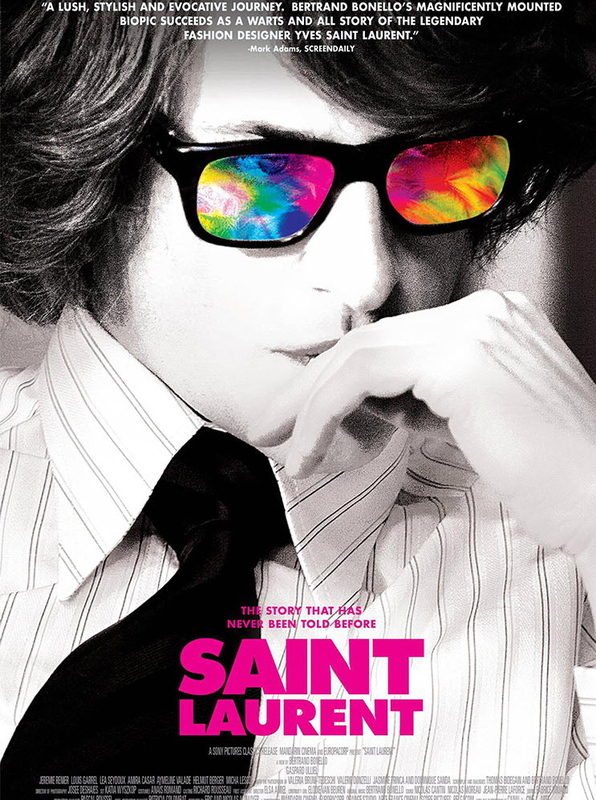 Not to be confused with the film Yves Saint Laurent that came out last year, this is not a feel-good movie. See it if you have a passion for the designer and to get a glimpse of glamorous and decadent Paris of the '70's. But be prepared for some depressing scenes of Yves getting too deeply involved with drugs and alcohol. There are some fabulous individual views in the atelier and on the runway, but the movie as a whole is long and feels emotionally empty. And beware, if you are a dog lover, there is a heartbreaking scene with his bulldog, Moujik. Saint Laurent is too much about the designer's excesses. Yves Saint Laurent featured his original creations, but the film feels stiff with minimal style. I suppose that's the downfall of fashion biopics. They often feel forced without the depth that I imagine the featured person would have. For that reason I prefer documentaries. If you are interested in Yves Saint Laurent, I recommend His Life and Times and 5 Avenue Marceau 75116 Paris.